We strongly believe that responsible global citizenship calls for a corporate culture that embraces a sense of mission to meet the expectations of diverse stakeholders – a culture that is committed to operating under the highest ethical standards in line with the expectations of society as a whole. Based on this belief, we advance the operations of the entire Group under The RICOH Way, strengthening our governance and ceaselessly promoting a culture of integrity while working toward sustainable corporate growth. The Ricoh Group has also introduced a corporate audit system, in which audit and supervisory board members strengthen the effectiveness of audits and the monitoring of top management, while the Board of Directors, including outside directors, maintains strict oversight over the decision-making process to make sure it is always transparent and fair. Furthermore, by expanding the executive officer system, the segregating of duties between oversight and business execution is clarified, resulting in speedier decision-making. The Group has also implemented an integrated risk management system for both business opportunities and business execution, and it follows internal control procedures to achieve the success of our corporate strategies and business targets. The Ricoh Group has introduced a corporate audit system. The Board of Directors is responsible for management oversight and important decision making concerning Group management. By appointing highly independent outside directors, the Group ensures greater transparency in its management and decision making. 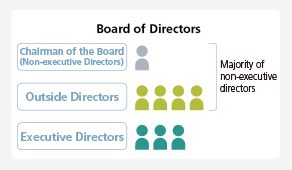 Four of the Board's eight directors are outside directors – part of an effort to incorporate various views and opinions and to eliminate arbitrary decision making in management. The Board of Directors Office is setup to support the Board of Directors, driving robust decision – making and ensuring transparent managemtnt oversight. Audit and Supervisory Board members hold discussions to determine audit and supervising policies and the assignment of duties, and monitor corporate management. Audit and Supervisory Board members attend all important meetings, including but not limited to Board meetings, and exchange information regularly with the representative directors. The Audit and Supervisory Board Members Office, with designated support staff, has been established to ensure that the Audit and Supervisory Board members can work effectively. Under the executive officer system, the authority to carry out business has been assigned to respective functional departments so as to expedite decision-making and clarify the roles of each department. As part of the strengthening of management oversight functions by the Board of Directors, the “Nomination Committee”, which is chaired by a Non-executive Director, and the “Compensation Committee”, which is chaired by an Outside Director, with the majority of members on both committees being Non-Executive Directors and at least half of the members being Outside Directors, were established to ensure transparency and objectivity of nomination, dismissal and compensation of Directors and executive officers, etc. And the Board of Directors Office was set up to support the Board of Directors, driving robust decision-making and ensuring transparent management oversight. The Group Management Committee (GMC) consists of executive officers and is a decision-making body empowered by the Board of Directors. The GMC facilitates deliberations and renders decisions on the Group's overall management from the perspective of total optimization. The Internal Management and Control Division, which is in charge of internal auditing, objectively reviews and assesses the status of business execution by respective business divisions according to clearly defined rules to ensure legal compliance and adequacy of execution practices. It also provides advice and recommendations for improvement. The results are regularly reported to the GMC's Internal Control Committee. Ricoh has formulated a set of guidelines called the “Policy and Procedures for Prior Approvals for Audit and Non-audit Services.” In accordance with these guidelines, advance approval must be obtained from the Audit and Supervisory Board members concerning the details of and fees for auditing contracts. The Company carried out an evaluation of the effectiveness of the Board of Directors meetings held during the year ended March 31, 2018, specifically the year starting in April 2017 and ending in March 2018. The following summarizes the results of the evaluation. For the purposes of this evaluation—as we head into the fiscal year ending March 31, 2019, in which the Company will steer in the direction of its growth strategy—the Company not only conducted an evaluation from the perspective of improving the effectiveness of the Board of Directors, it also evaluated the business execution that is subject to supervisory monitoring. This approach was taken in recognition of the fact that it is necessary to create an environment in which both the Board of Directors and the business execution system can collaborate appropriately, and with a suitable sense of tension. Specifically, all Directors and Audit & Supervisory Board Members evaluated the levels of achievement of two items for improvement, which were proposed last year (see below), the effectiveness of the deliberations, decision making and supervision of the Board of Directors, and other matters including the response to business execution checked at the Board of Directors. The evaluations were made in advance by writing evaluation comments in free form, which were then shared and discussed among the members. The following is a summary of the content of the evaluation comments, and the results of subsequent deliberations. In response to the evaluation of the effectiveness for the previous year, the Company's Board of Directors set basic policies and four specific items for improvement with the aim of steadily achieving improvements to increase the level of effectiveness. Create an environment in which structural reform will be advanced through appropriate monitoring. Clarify the future direction of the Company through discussions on the growth strategy. Establish a supervisory structure that will promote sound management to contribute continuous growth and increasing corporate value. Carry out checks and improvements of the governance structure that encompasses the Board of Directors, the Audit & Supervisory Board and Internal Control, for boosting the effectiveness of audit and supervision. Take action on execution and conduct monitoring toward the change of corporate structure to contribute to continuous growth. With respect to the actions mentioned above, key views presented in the evaluation meeting as follows. Evaluations recognized that effective improvements not bound by pro forma standards had been implemented in order to further enhance corporate governance, including changing the term of appointment for directors to one year, enhancing evaluations of the Ricoh President and other directors, reviewing the advisory system and information disclosure processes, and holding governance review committee meetings as a comprehensive form of governance check. Meanwhile, remarks were made to the effect that it will be necessary to seek further enhancements in global governance with respect to affiliate companies in the development of the growth strategy, and to enhance the Company's risk management system, crisis response system and headquarters function toward achieving this. Taking action on execution and conducting monitoring by the Board of Directors was evaluated as follows. 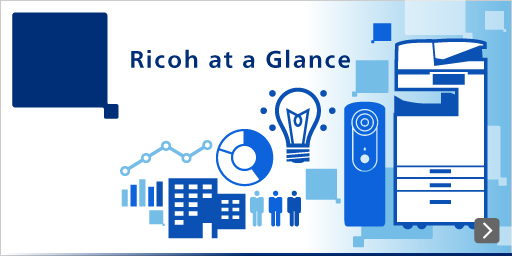 Under the new management structure, which employed Ricoh Resurgent, decisive decisions have been made with regard to several key management issues. Open and uninhibited discussions were conducted in the process of making these decisions, and the Board of Directors implemented appropriate engagement and monitoring. Initiatives related to management issues were surely and consistently implemented through taking action on execution by the Board of Directors. Appropriate reports were made to the Board, and this helped to promote swift and accurate consensus formation and decision making. Agendas for discussion are being scheduled appropriately, with a primary focus on priority agendas for the purpose of enhance discussions and making decisions on important matters, and fixed agendas for the purpose of enhancing monitoring. The execution required to respond to many key management issues was evaluated as follows. Since the introduction of the new management structure, an improvement was seen in the quality of discussions and information provision at Board of Directors meetings, and transparency in management increased. It was found that, through the President's leadership, deliberations and decisions made by the Board of Directors are sincerely accepted in response to key issues, with a proactive attitude. These are in turn being steadily translated into actual results, primarily in structural reforms. 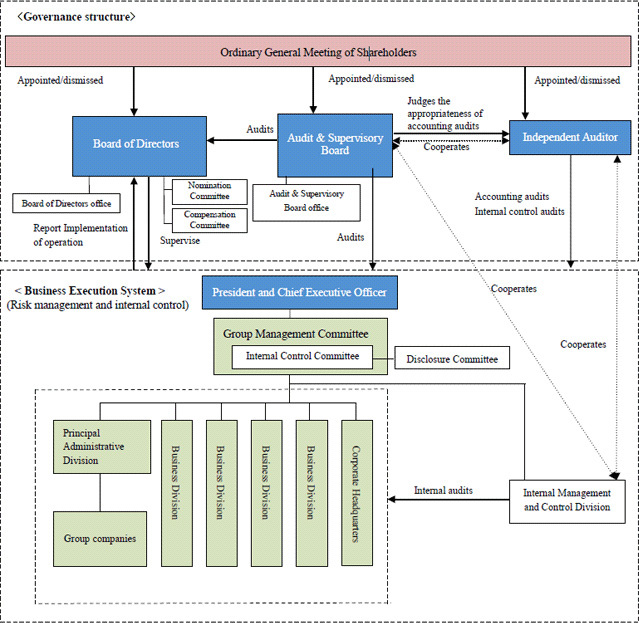 Meanwhile, remarks show that in order to implement future growth strategies, it will be necessary to improve group management control capabilities as a headquarters function and implement checks and improvements with regard to structural aspects such as organizational and authority-related design toward changes in business structure. In view of the evaluations presented above, in moving toward the implementation of the Company's growth strategy, Ricoh Ignite, the Board of Directors will operate in accordance with the following basic policies, and will seek to make further improvements to enhance its effectiveness focusing primarily on the following three items for improvement. Provide supervision and support to increase earning power and ensure the implementation of the growth strategy. Promote the creation of an environment for the appropriate management of risks in global business development. Monitor the state of progress of growth strategies (Strategy #0,#1,#2), and hold appropriate discussions and provide appropriate support according to the situation. Seek to implement checks and improvements with regard to governance and risk management, which support global business activities. Promote a swift and appropriate response to the remaining key management issues, such as optimization of the Company's North American marketing structure and cost reductions, through monitoring and taking action on execution. In its pursuit of increased shareholder value, the Ricoh Group employs executive compensation as an effective incentive to achieve a sustainable increase in corporate earnings over the medium and long term. Basic compensation consists of compensation pertaining to management oversight and compensation reflecting the importance of individual roles and management responsibilities. 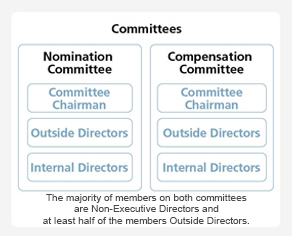 In addition, compensation based on positions is additionally provided for the Representative Director, Chairman of the Board, Chairperson of the Nomination Committee and the Compensation Committee, etc. The amount of bonuses paid to Directors is determined based on the achievement of key performance indicators, which reflect the improvement in shareholder value and enhancement of the Company's competitiveness. Operating income was decided as the key performance indicator serving as the standard for bonuses at the Compensation Committee held on December 12, 2017. By setting operating income as the key performance indicator, which is strongly correlated with market capitalization, it further clarifies responsibilities of Directors for the business results of the entire Ricoh Group and the improvement of shareholder value. In addition, regardless of the results calculated through this framework, whether or not a bonus will be paid reflecting the status of governance and nonfinancial factors will be discussed and decided by the Compensation Committee. Compensation of Audit & Supervisory Board Members is appropriately reflected by expected role of the Auditors only. Ricoh verifies the appropriateness of time spent on auditing together with audit firms and certified public accountants (CPAs), taking into consideration the scale and characteristics of our businesses to determine final compensation for auditing services. Fees for audit services and non-audit services paid the Company and its subsidiary to KPMG, which belongs to the same network as the Company's accounting auditor, were ¥1,324 milliion and ¥224 million respectively.